Liverpool FC got the spot for the semi finals! 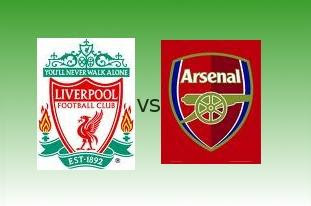 After a tied result in the 1st leg match, Liverpool FC capitalized against Arsenal FC match leaving a (4-2) win on their second leg match and a (5-3) win on aggregate. Arsenal FC's Abou Diaby started the scoring after when he received Alexandr Hleb's short pass and drilled it inside Reina's near post just 13 minutes after start(0-1). On the 30th minute, Sami Hyppia replied to the 1st goal when he met Steven Gerrard's deep cross with a towering header right into the far post(1-1). Then on the 2nd half, goals from Adebayor(2 goals), Torres, Gerrard, and Babel arrived to sum up the (4-2) result in favor of Liverpool. Again, another English Premiere league team went through to the semi finals. 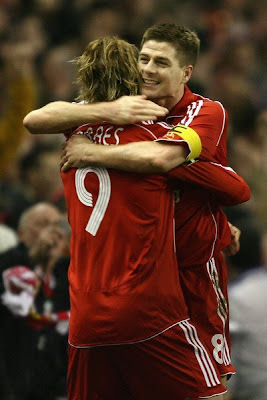 Steven Gerrard celebrating with Fernando Torres after he delivered the penalty kick.